You may have damaged,frizzy hair and your hair has may have stopped growing . Reason for all of this might be split ends but if your are thinking that cutting or chopping your hair strand is the only way to get rid of them then you are wrong. There are many natural ways to help you with any kind of problem and help your hair to repair and remove them. Split ends are sign that the hair is damaged and they need proper care and attention. When they lack any nutrient they start getting parted in two sides which will look or create split ends. Lets see some natural ways how you can get rid of split ends . Take some oil on the palm and warm it. Apply this oil on the roots and tips. Make sure you applying enough oil to the tips and leave it for overnight. Wash your hair in the morning and let them dry naturally. Coconut oil provides enough nourishment and miniaturization that lack by the roots and they result in split ends. Take the coconut milk in your palm and apply it’s from the roots to the tips. Wash your hair in the morning with a mild shampoo. Use this once every three days. Coconut milk is loaded with vitamin E that gives proper moisturization and keep the ends of hair healthy. Shampoo your hair as you. When your hair are still damp take the oil on the palm and apply it from mid length to the lower. Leave it and dry your hair naturally. Do this every time when done shampoo. Argan oil is extracted from the argan kernels, which repair the dry and damaged hair. It also adds the shine to your hair and make it healthy. Shampoo your hair and apply this oil on the damp hair. Leave it on for dry naturally. Do thus every time when you shampoo your hair. This oil is rich in vitamin E, omega – 3, omega – 6 and fatty acids. It makes hair soft, shiny and moisturized. Dilute the castor oil in coconut oil. Take some of it and apply it on from the roots to the ends. Wear a shower cap and let it stay for 1-2 hours. Rinse your hair with a herbal or any mild shampoo. Castor oil repairs and rehydrates the hair roots and ends, prevent itchiness and make hair strong. Apply this mask from roots to the ends. Wear a shower cap and leave it for 1-2 hours. Shampoo your hair with herbal shampoo. Dry your hair naturally and do not use dryer. Honey nourishes the hair and make them strong, where coconut oil and coconut milk helps in locking the moisture in. Mix the papaya pulp and other ingredients. Make a paste and apply it on your hair from roots to tips. Cover it with a shower cap and leave it for 1 hour. This natural remedy provide deep nourishment to the hair. The mix of papaya, yogurt and almond oil repair the hair and improve the texture of the hair. Mash the banana in a bowl and add coconut milk in it. Mix them or blend them really well. Apply this mask on hair and let it sit for 1-2 hours. Wash your hair with a gentle shampoo. Banana is a natural conditioner and works great for repairing the split ends. This mask is rich in oils, antioxidants and minerals which prevents the breakage. Mix egg, coconut oil and honey in a bowl. Apply this mask on hair from roots to tips. Egg is rich in protein and hair is made of protein. So this mask not only prevents the split ends but also adds shine to the hair. This provide nourishment to the damaged hair thereby removing split ends. Mix the mayonnaise and aloe vera gel on a bowl. Apply this mask on the hair from roots to the tips. Leave it for on your hair for 1 hour. Mayonnaise is made of eggs and oils both. It hydrate and nourish the hair which repair the hair, split ends and make them healthy. Mash the avocado in a bowl and add almond oil in it. Apply this mask in the hair and leave it for 1-2 hours. Shampoo your hair and towel dry your hair. Avocados are rich in vitamin E, minerals and other nutrients that helps retain the moisture in the hair and prevents further damage. Mix fenugreek powder and curd in a bowl. Apply this paste on the hair from roots to the ends. Wash your hair with a herbal shampoo. This fenugreek hair mask is used for split ends since ages and proven the best. It nourishes and hydrates the hair, prevents damage and grow hair. After doing shampoo and conditioner hive your hair a final rinse with lemon water. Dab your towel to soak the lemon water, do not rub it. Use this every time you wash your hair. Lemon water is an excellent hydrating agent. It retains the moisture and prevents further breakage of the hair. Mix onion juice, coconut oil and olive oil in a bowl. Apply this on the hair avoiding the scalp area. Shampoo your hair and dry them naturally. Onion juice is rich in sulfur that prevents hair breakage and thinning. It provide nourishment and reduce the amount of split ends. Mix the aloe vera gel with lime juice and apply on the hair avoiding scalp. Cover it with a shower cap and leave it for 1-2 hours. Aloe vera is known for its hydrating and moisturizing properties. It provides the nourishment to the damaged hair and prevents split ends. Apply this mixture on the hair from roots to the ends. Curd is rich in minerals and vitamins. It moisturize the hair and prevents them from breaking. Transfer it in a spray bottle. Spray this mixture on the hair and cover it with a shower cap. Rose water boosts blood circulation and improves hair health. This mask nourish your hair and reduce the chances of reoccurring of split ends. Transfer it in a spray bottle and shake it well. Spray this mixture on hair and leave it for 1 hour. Shampoo your hair and condition them. Sea salt maintains the ph level of the hair and lock the moisture in it. It also tackle the frizziness of the hair too. After done with the shampoo rinse your hair with this solution. Leave it for 5 minutes and then rinse it again with plain water. Apple cider vinegar soothes the hair and there by prevents the hair from breakage. Apply this mixture on hair. Beer contains sugar and protein which strengthen the hair and prevents split ends. Take the oil on your palm and massage it on the hair from roots to the tips. Massage it for 5-10 minutes and leave it for 1 hour. Rinse your hair with a good shampoo. Walnut oil is a great source of goods fats that nourish and strengthen the hair and prevents split ends. Apply this mixture on the hair and cover it with a shower cap. Tea tree oil has anti fungal and anti bacterial properties which maintain the hair and scalp health. It repairs the damage hair. Deep conditioning the hair is really important if you want to make your hair healthy and to remove the split ends. Use a deep conditioning mask for your hair type every week. Using a microfiber towel is a turning point for your hair. It maintains the health of the hair and prevents them from damaging further. This towel is specially meant and made for the hair. Yes! Cutting and trimming your hair on regular periods are really important. If you want to grow long and healthy hair then cutting them is the best thing you can do to your hair. Trim your hair once in every three months. 1.Cutting hair every three months will help in growing hair? Ans: Yes! Cutting the damage hair will ensure the growth of the hair. 2.Can one use lemon on the itchy scalp? Ans: Yes! You can use lemon but in diluted form. 3.Can I take diet for the health of the hair? Ans: Yes! Diet plays a major role in the health of hair. Eat something which is rich in protein. So, these are some ways to prevent or get rid of split ends. 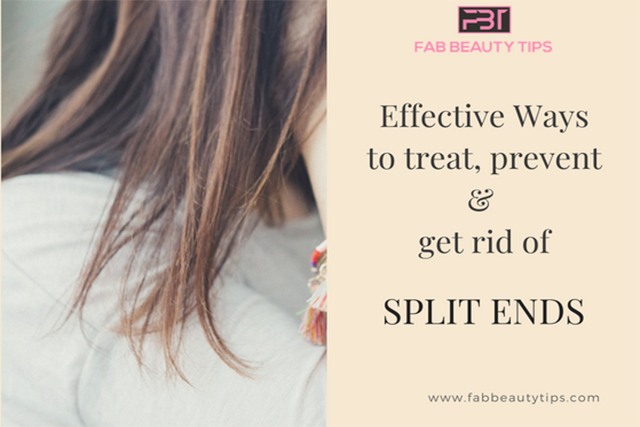 As split ends can be annoying and can ruin your look. Take care of them nicely and use these tips for further prevention. Do share this article with your friends too.